The funk will officially take the throne in Lafayette next week with George Clinton and Parliament Funkadelic. For decades, the singer, songwriter and bandleader has forged a strong identity for himself and his musical roots while continuing to morph his sound so that it exhibits the styles of each passing era. Clinton and his group will play classics from decades past — think "Atomic Dog" — along with new work that includes a collaboration with Kendrick Lamar and Ice Cube: "Ain't That Funkin Kinda Hard on You?" 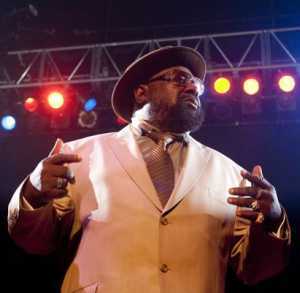 George Clinton and Parliament Funkadelic play at 8 p.m. Wednesday at Lafayette Theater, 600 Main St. Here are excerpts from Clinton's interview with the Journal & Courier. Question: I read where you did an interview saying that when you heard older musicians say new music wasn’t any good, you went out and found a way to use the new music. Is that a way you’ve kept your sound fresh? Answer: Yes, basically. Whenever music comes along that scares the hell out of you or you don’t like, it’s usually the music that’s getting ready to put you out of business. I found that that’s the key to, actually, longevity. … And you actually end up ... with a younger sound. Q: Do you ever feel like people categorize you as the same act from the '70s and '80s even though your sound has morphed? Maybe make you feel trapped by the past? It was always easy to do because we never do the same songs again, and we always get new fans every year (in) college, so we never felt like trapped in no era because the kids was always new when learned the funk for the first time. We’ve always enjoyed it — as a click people wanted to be down with the funk. Even today, as old as it is, we still get teenagers proud of themselves for knowing ... about the funk. Q: You’ve always followed your own path in music — did you ever feel the need to make a record that would be popular in the mainstream? A: In the early days, yes, but that’s the main reason we went off into the funkadelic thing where we didn’t have to make a single every time. We wanted to be like jazz musicians or like rock 'n’ roll musicians, gospel music who could make albums, and you didn’t worry about a 45. If we got a 45, fine, but overall, the fans that loved groups (for) a career were jazz musicians, rock 'n’ roll and gospel music. So we went into funkadelic, which allowed us to sell albums. We very rarely had a single, but when we did get them, they were like “Flashlight,” “Atomic Dog.” They were weird, and so they didn’t have no competition. When we got a hit record, we got it on our own terms. Q: You’ve been known for playing long sets on stage — you’re able to just keep going. How do you do that? Don’t you get tired? A: Funk, the longer it go, the easier it get. I mean, that’s when you talk about in a groove or in a pocket. The longer it lasts, after a while, it just become second nature, you know, like a trans. Like James Brown, like African chants. ... The longer it go — it’s called a groove — you get in that zone, and it’s not hard at all. You don’t need no energy. It’s its own power. Q: Something else you’re known for is your wit and your lyrics. Does the writing process come easy to you, or is it something you go back and work through? A: I have to go back and work through it every now and then because styles change, and the way people hear the lyrics and stuff change, and you have to be up on it even though you might know a lot of lyrics. What kind of slang they’re using, and at certain periods of time, you have to be aware of that. Even if you don’t do it, you still have to be aware that it exists. And so I’ve studied everybody that comes out lyrical, you know, from … Eminem, now Kendrick Lamar. … And somebody like Taylor Swift, you know (most) country western people can write lyrics excellent, so that wasn’t surprising to me that she would be so popular. And people pay attention to lyrics because that usually happens in Nashville and stuff. But I like people that write, and ever since Smokey Robinson — that was my idol. And Curtis Mayfield. They were my idols in the '50s and '60s. Then the Beatles come along and they change the style of language to the psychedelic era of Jimi Hendrix. And you have to start paying attention to lyrics from the '60s from that psychedelic slang that everybody used. We had to learn that coming out of Motown, which was straight R&B clever lyrics into nonsensical '60s music when nonsensical stuff was the art form. You had to pay attention to Bobby Dylan and all of the psychedelic writers, which was to me a stream of consciousness type of lyrics like Jimi Hendrix. Communicating through drugs — you had to learn that language. And it changes again when hip-hop come along. … You had to learn what all that meant. And to me it was the same as the '50s “ba ba-ba ba ba ba ba-ba ba.” You always go back to kiddie lyrics after you get so sophisticated. The whole industry reverts back to something really simple, and right now, the last (few) years, you know, from Lil’ Wayne to Drake, through all of that (and) now Kendrick Lamar is … making that the slickest that it’s ever been. Even though you still have the sound of what the hip-hoppers do, his lyrics are way different, and he’s not talking about “beat the b----” or “sucka MC.” You know what I’m saying? … He’s got a whole other conversation, and he’s still that hip-hop superstar right now. (His) lyrics are superb; his metaphors are brand new. I have to, like, learn that now. That’s a whole other style. Q: You said in your book that you have been successful in part because you knew your strengths and limits as a vocalist and instrumentalist. Can you talk about that a little bit? A: I don’t play an instrument, so I respect the musicians that do play them, and I try to find someone that do play them good. And I usually let them play what they do and try to make it work with what I’m doing. I can’t tell them what to do, like I really don’t play, but I can hum it and tell them when it sound good to me. But I also have to pay attention to the age (of the person) I’m talking to because it might just something new that I ain’t hip to yet. But yeah, that’s the way I look at it. Q: Another storyline is that you’ve been clean from drugs for a while now, and I wanted to ask what the hardest part about that was and how you feel now. Once I decided that I wasn’t going to do it at all, that was the easiest thing in the world to do, and I knew that if I did do it, I would catch everybody off guard and clean up. And before they knew it, I would have a good insight as to what’s been going on because I didn’t know what was going on because I was out there ... high all the time. I had to actually get clean to understand what had happened to me. So once I did that, I was able to put all the ducks in a row, write the book, do an album with 33 songs on it, do a video with Kendrick Lamar and Ice Cube. And here we are right now with our career as hot as we’ve ever been. Q: And for readers who don’t know about the copyright issues, in a nutshell, what was the issue? A: Right now, there’s at least 1,100 songs that’s being manipulated and (a) conspiracy to control them to the fact that we don’t get our money from all the songs that’s in “Straight Outta Compton” right now. … I’m saying it’s millions that they owe us for those songs that they’ve never paid us. And they don’t intend to pay us. That’s between … Universal Records, BMI, all of them stand to gain a fortune by keeping us out of it. I’m asking for an investigation for that whole payscale for that movie. And Cube is a friend of mine … but he had no idea that I wasn’t getting paid for anything that they’ve done all these years because he’s not the one who has to pay me. The record companies and BMI and the publishing companies. But this time, we’re making all the noise we can make because people have to know. You’re talking about hundreds of millions of dollars. And you’re talking about the copyrights to my heirs. They trying to take all of that right now. So I have to be really clean to make this statement because ... every time we get a newspaper that get ready to do this story, for some reason, they got good lobbying in Congress or something. But between the lawyers and the Congressional stuff, we haven’t been heard yet. And we going to be heard because we going to make so much noise to turn the funk up. Q: So you’re saying some of the music that was used in “Straight Outta Compton,” that’s the money that you say you’re not getting. We have a hard time getting lawyers to try to fight this. I’ve spent millions of dollars trying to bring this to the public’s attention. So that’s what I mean when I say the copyright issue. It’s one that’s going to be phenomenally in the future because we got good records of it kept on this Flashlight2013.com — every case we’ve been in, we keep the records on that so people are able to look at it and see exactly what we’re talking about in chronological order. Q: You’re known for your stage presence. People have been in diapers on stage, you’ve landed in a spaceship on stage, so I wondered what we should expect when you come to Lafayette. A: You never know what I’m going to do. (Laughs.) There’ll be definitely outfits and costumes. Q: Any word on what your hair will look like? A: Oh, you know I cut my hair off. Q: I know, but I didn’t know if you were staying with that style.